You know two things if you’re headed to Fastasia Gelati for a treat during your day at Disneyland Paris: 1) There’s ice cream in your future 2) So are lines. Epic lines. But, if ice cream is what you need and you stick it out, you’ll be handsomely rewarded with a generous helping of the good stuff. 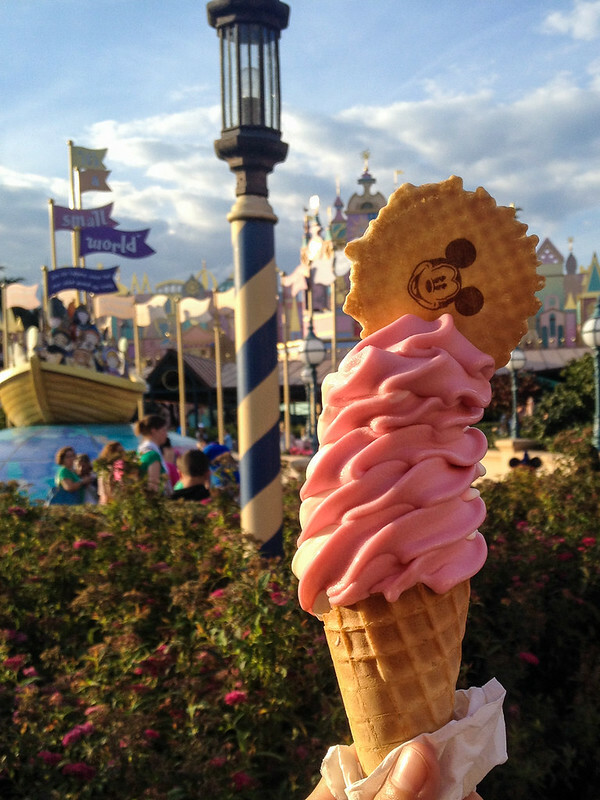 While Gibson Girl Ice Cream Parlor on Main Street U.S.A. has unfortunately eliminated their hand scooped variety in favor of prepackaged ice cream cups, Fasntasia Gelati offers up real scoops of Carte d’Or as well as soft serve “gelato.” Rounding out the small menu are crepes and beverages. Outdoor seating is hard to come by with Fantasia Gelati being situated in Fantasyland near it’s a small world and Pizzeria Bella Notte. Not to worry though, your treats are portable and nothing beats a stroll through to Discoveryland, delicious ice cream in hand. You’ll have plenty of time to appreciate the theming here, from the murals of “The Pastoral Symphony” that dress the walls to the vines that hang over the menus- even the ice cream cone shaped lamps, this Fantasia themed quick service stop is small, but it’s a great choice for a sweet mid-day pick me up.